It has been the policy of the Federation to grant Fresno the Statewide at frequent intervals due to its central location, nearly equi-distant between the North and South. Besides, Fresno always puts on a great show and the Basque food is something else. 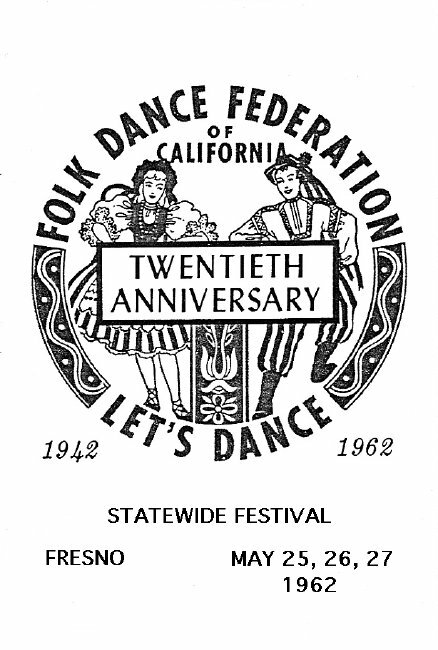 In 1962 they were again our hosts for a three-day Annual Statewide Festival and their program frontpiece carried a replica of the official Folk Dance Federation "Let's Dance" emblem, with the center reading "TWENTIETH ANNIVERSARY." So as not to confuse anyone, they are referring to the life of the Federation, North, not the number of Statewides which happens to be 17. I think, at this time, I will give a little credit to two otherwise not especially preeminent members of the folk dance family. We are proud to have known Bob and Eleanor Elsocht, both of whom were fine artists and also happened to be folk dancers, in fact members of a class Helen and I taught for some 12 years, the Castle Promenaders. This fine couple designed the folk dance emblem that the Past Presidents so proudly wear but it is doubtful many were aware of who is responsible for the design. Life and time is cruel that way and I hope my mentioning their contribution will help keep their names fresh in our memory. Where are they now? Only their closest friends probably know. For the previous sixteen Statewide programs I have tried to cover events for each day. In as most programs follow rather a standard pattern I am changing the format of this, the 17th, and will concentrate more on names in an effort to condense the narrative. Where something of a special nature takes place, of course I will mention it. 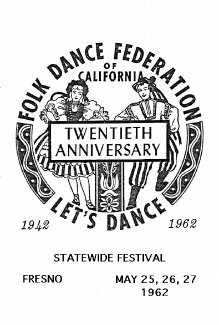 The Festival Committee General Chairperson at Fresno were Jim Scott and Mary Spring, assisted by Federation coordinators Tony Ryan and Avis Tarvin. Robert Chevalier was president of the North and Ralph Miller was president of the South. Our headquarters was the lovely California Hotel, where registration as well as the Evaluation Breakfast, the After Parties, and the Kolo Parties took place. Teachers for the Saturday afternoon Institute were Ned Gault, Madelynne Greene, Maureen Hall, and a delightful and talented new-comer, Vince Evanchuk. The main Festival programs were held Saturday night and Sunday afternoon in the Fresno Memorial Auditorium with one of the features being the International Food Market folks who displayed and served for our enjoyment, those exotic foods. The exhibitions both Saturday and Sunday were excellent with many new groups and new directors. It was noce to see Buzz Glass, first Federation President, MCing one group of exhibitions. Fresno always has been kind to me. Maybe I have been on an ego trip as they always ask me to MC a group of dances and also to call a square. The Seventeenth Statewide was perhaps a little shorter than some but a fine festival.